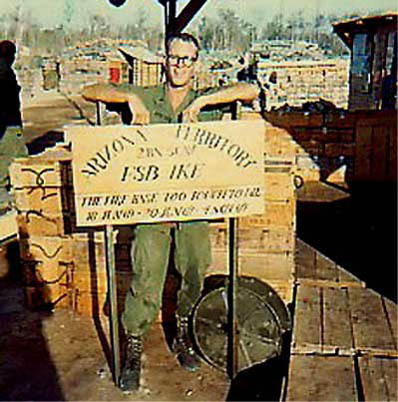 Most of November was spent on FSB Ike, a fortified base built near one section of the Ho Chi Minh Trail known to Americans as The Mustang Trail. Obviously it was a thorn in the side of the Communist forces as they attacked Ike throughout most of the month. On the morning of the 3rd, the company received orders to move to a clearing in order to be picked up and returned to FSB Ike and to assume base defense duties. (Webmaster note: This was the same LZ Ike that was built by C 2/5 Cav April 21-28, 1969.) Everybody was glad to receive the new mission. Upon arriving at the PZ, the CP, 1/6 and 2/6 went up one side of the clearing. 3/6 went up the opposite side of the clearing to provide flank security and to cover the final extraction. Shortly after all elements were in position the main body was hit with an RPG ambush. Several troopers were wounded. The entire company returned fire but results were unknown. A Medevac was requested and the wounded were evacuated. Later that day lift ships extracted the company and returned it to Ike. From an email from Dan Bertram: On Nov. 3, 1969 the company moved into PZ position to return to Ike. I told SGT Charlie Dickey, the Recon Sergeant, and my RTO to stay with the CP, 1/6 and 2/6, and I would go with 3/6 to provide flank and final extract security. Wouldn't you know it but the main body got hit with an RPG ambush while waiting for pick up. Several troopers including SGT Dickey were wounded. Fortunately he was not seriously hurt. He received some shrapnel wounds to his shoulder. All of the wounded were Medivac'd before the rest of the company was extracted. When I got to Ike that afternoon he came to me with his shoulder dressed, drinking a coke, smoking a cigarette and grinning like a Cheshire cat. 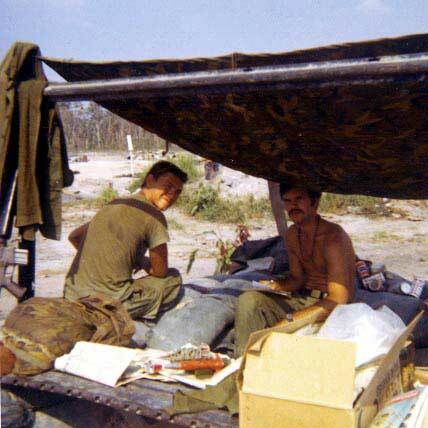 He advised me that he was being sent to Bien Hoa for a week's light duty. I watched him leave, neither of us having any idea that that night Ike would come under a major artillery and ground attack. "Around 11 PM, my guys picked up lights in the wood line, and we fired it up. No one thought much of it." Late the night of the 3rd, (2200 or 2300 hr) Ike was rocked by an explosion followed by another and another. Shouts of “incoming, incoming” were followed by shouts of “gooks in the wire”. A massive barrage of mortar rounds, rockets and RPGs rained in on the base. From the northeast side of the base NVA sappers had already penetrated the wire and were being followed by enemy infantry. "Most of the attack came right at 3rd Platoon, with another major thrust across the log pad at 1st Platoon. A trooper with an M79 took out several NVA who had satchel charges strapped all over them, and that seemed to blunt the thrust." The first thing I remember was the radar tower being hit. It looked like a rocket launching for a minute as it literally went up. we had green tracers coming from the mess hall. I don't know how many NVA were in there, but it was quite a few. The next morning we found c-rations that were open! I guess they were hungry." Comanche's troopers rushed to their fighting positions and began a battle that would rage until dawn on the 4th . The enemy was engaged with M-16, machine guns and grenades. Fighting was at point blanked range. Many NVA breached the berm and were inside our positions. One of the first enemy rounds hit the POL (Note: Petroleum, Oil, and Lubricants - the fuel dump) point and set it on fire. The fire did provide some initial illumination. The silhouettes of the NVA infantry could be seen as they came over the berm. Many of our troopers had to turn their attention to fighting that enemy inside the base while others were repelling the oncoming attackers. "As soon as our side was covered (Webmaster note: meaning 2nd Platoon's portion of the perimeter was manned and secure), I took some guys to help 3rd Platoon. I ran into LT Petruska - he took most of the 2nd Platoon, and I stayed with the people on our side. I remember melting the gas tube on an M-16. Larry Burr or our platoon was wounded by a chicom (Webmaster note: a Chinese Communist hand grenade), and we took him to the Aid Station. When the Cobra section, Blue Max 28D2, arrived on station it made its runs from northwest to southeast. They were loaded with flechette rockets. Their rockets and mini- guns provided devastating fire just outside the wire. The pilots flew directly into the enemy’s ground fire. "The Cobras were so low at times, I thought they would get caught in the wire." Tall Comanche was suffering many wounded. They were evacuated to a point centrally located inside Ike. As the battle was raging, a Medevac bird was requested. Several troopers with the battalion CP took down the two-niner-two radio antennas as the fighting continued. The Medevac pilot brought his ship right into Ike while being fired upon and picked up the wounded. After his liftoff, the troopers re-erected the two-niner-twos. As the night progressed the NVA’s assault was halted and they began their retreat. Tall Comanche's troopers continued to fight with their small arms and automatic weapons. The supporting artillery batteries continued to pound the withdrawing enemy soldiers. By the time dawn was breaking on the 4th, the NVA had fully retreated into the jungle and the firing ceased. 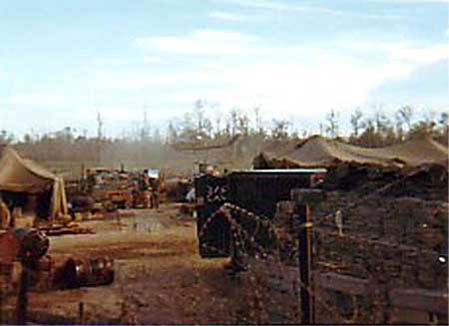 During the day other companies of 2/5 Cav were moved to positions to engage the retreating enemy forces. At sunrise the soldiers on Ike began to assess the previous night’s activity. The area from the berm to the tree line was strewn with dead NVA. All of the sappers and infantry who made it into Ike were killed, with one exception. Apparently three sappers who got inside Ike got scared, probably by the barrage of their own artillery. They decided to take refuge in one of our bunkers and ended up sitting in the bunker through the entire battle. When one of Comanche's troopers entered the bunker to get his own gear he encountered the three and immediately came running out shouting “Gooks, Gooks”. Several more troopers grabbed their M-16’s, drew down on the bunker and started commanding “Chieu Hoi - - Chieu Hoi”. The three enemy soldiers came out with their hands up and were taken prisoner. They were later evacuated to an EPW camp. A patrol was sent out to sweep the area between the berm and tree line. After giving an estimate of the enemy dead, the battalion surgeon decided that a health problem could arise. That many bodies lying in the sun, in a high humidity area was going to be a problem. The bodies had to be buried quickly. A request was sent to the 8th Engineer Battalion for a back-hoe. It was flown out by Chinook helicopter. A mass grave was prepared and the bodies were buried. 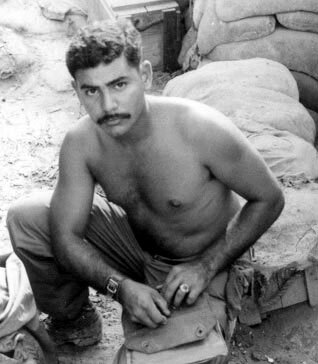 "The next morning I led a reconnoiter in the tree line and brought back several (I'm guessing more than 50, but less than 100) NVA. I know the official After Action Report said 96 dead NVA. I think they were off by an order of magnitude. It took all day loading bodies on the mule and taking them out to the pit the engineers dug." During the day of the 4th repairs were made to equipment and bunkers damaged by the artillery barrage. 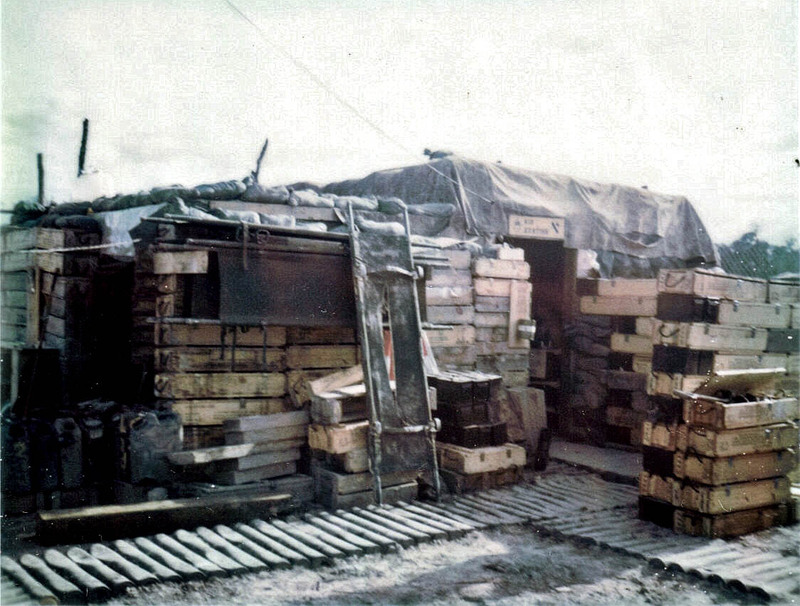 Hooks (Note: Chinook helicopters) brought in badly needed re-supplies of class five (ammunition) and other equipment. A/1/77 FA lost one gun completely, several guns were totally out of ammunition, and the others were down to two or three rounds. Several of the guns were down to firing illumination rounds as direct fire. If it would go out the front end of the tube they shot it. 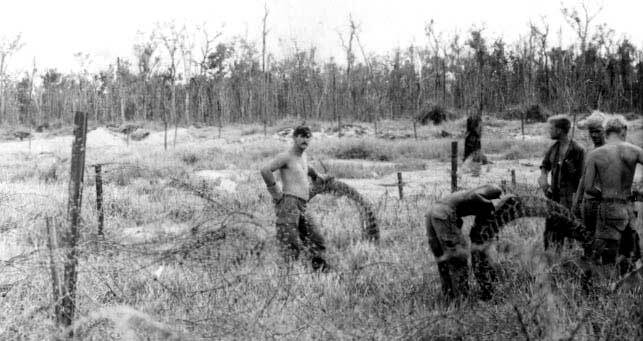 "During the attack NVA sappers had breeched the perimeter and were making their way towards the TOC/Gun pits (take your choice). As they went by this kid's bunker, he emerged dressed only in OD boxer shorts. There were 5 NVA who said something to the kid and went on by. Well, the kid had his M-16 and laid the 5 to rest." The trooper from Guam was taking out NVA one by one as they came through the berm, and I believe the number of NVA he killed was greater than five. "Bob Davis (26D) also got a Silver Star, for holding his position in the middle of it all. He was tossing frags over the berm for most of the night. He says some times they'd toss them back." 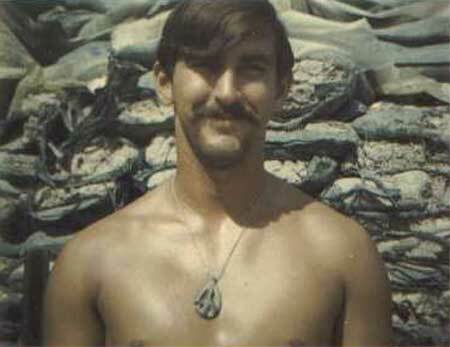 Lonny Branch, medic attached to 2nd Platoon, was awarded the Bronze Star with "V" Device. Also, that November attack on LZ "Fire Base" Ike was something I'll never forget. I was the FDO (Fire Direction Officer) inside the Battery A, 1/77th Artillery FDC when that attack occurred. I believe our XO was seriously wounded and I ended up outside with the gun crews before it was over. The . . report . . . indicated that somewhere around 30 NVA were killed. I saw at least that many dead inside the perimeter alone. And the bodies on the outside of the perimeter I thought to be in the hundreds, with numerous blood trails heading into the tree lines. Guaranteed, there were several hundred NVA KIA in that attack. I think I remember six or so U.S. casualties, 4 or so from Tall Comanche, one from a artillery gun crew, and one artillery cook. "About the cook - we took him out of a hootch, the kind made with a culvert pipe. Sometime during the fight, the cook went into the hootch. There were NVA in the hootch, and one of them got the cook with a B40." In the photo of IKE the building going up in the left corner was the command post being rebuilt after it was destroyed by the attack in November and rocketed again the same month!!!!! The tent in the right corner was the mess hall tent where the cook was killed. The ceremony was being held in pretty close to the center of IKE just about 25 yards in front of the ammo dump. When IKE was attacked they came in from that side of the LZ that the cameras facing." "I know we would go out with a 1/2 platoon, get dropped off, and come back to the LZ. I think I did this a couple of times. I had a Chieu Hoi who would spot bunkers and holes they had dug to prepare for the attack. An enormous amount of preparation had gone into their attack. One of the medics at the reunion (Webmaster note: the company reunion held February, 2000, in Atlanta) said some of the bodies had heroin. I know about a month later we went into some bunkers northwest of Ike and it was purported to be the hospital they used after the attack. According to one Kit Carson, we really wiped them out. There was a lot of heroin there." American bases northwest of Saigon. provinces along the Cambodian boarder. Binh Duong Province, was attacked about the same time. Vietnamese soldiers. It was the heaviest ground fighting in two months. and cannons patrolled the border searching for the attackers. with North Vietnamese elements four miles south of the camp at Duc Lap. to threaten both Special Forces camps and the city of Ban Me Thuot. major population center of the south central highlands. Eddie Hancock on FSB Ike. Also on FSB Ike - On the right is Bob Sellner. If you know the name of the trooper on the left, please contact the Webmaster. Members of 2nd Platoon stringing concertina wire on FSB Ike. Eddie Hancock on the left. Danny Mora, 2nd Squad, 2nd Platoon, on FSB Ike. The Battalion Aid Station on FSB Ike took care of many casualties in November. SSG Vance Gifford was a medic assigned to the 2nd Battalion 5th Cavalry, arriving on November 2nd. Two days later he was to see his first combat. Read his story of the attack on Ike here. For another view of the Aid Station, click here.